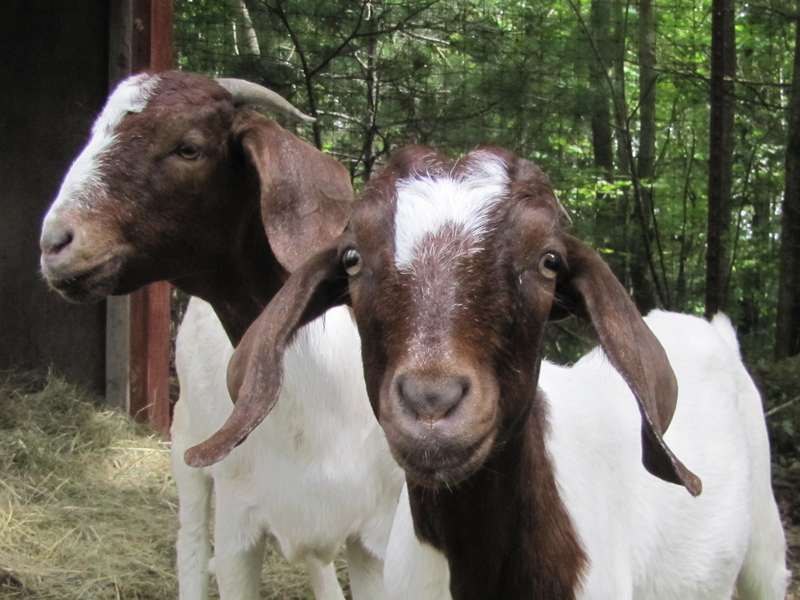 The most recent additions to our farm were our Boer Goats, Gracie and Jessie. They are both full-blood Boer doelings, and our hope is to use them as the foundation of our herd. Boers are relatively new to the US (introduced in the mid-90s), and meat goats in general aren’t nearly as common in New England as are those raised for milk and fiber. So, why did we decide to go with them? Well, the first answer is they just haven’t invented a 5-day-a-week milking goat, and until we’re able to farm full-time, milking animals are out of the question. The other reason was that we did want to start on some larger meat animals (beyond chickens and muscovy ducks). As we researched our options, we found that goats can be raised on about 1/4 to 1/8 the land and feed as cattle while reproducing twice as often (usually with twins, so 4 x the production overall) while requiring less maintenance. Being browsers that favor taller, brushy forage, they also compliment grazing animals like our horses as we manage our pasture land. Although goat meat isn’t nearly as popular in the United States as beef and pork, it’s one of the most widely-consumed meats worldwide, and I in particular am a big fan. Plus, with our proximity to certain ethnic centers, we realized there was a good, largely unmet market for goats. Another advantage is the the nutritional value of goat meat. Goat meat (sometimes called chevon) is an exceptionally healthy and lean red meat. Compared with beef, pork, lamb, and even chicken, it is lower in calories, cholesterol and fat. Even better, the low ratio of saturated fats to unsaturated fats in goat meat makes it healthier as well, as unsaturated fats tend to increase the High Density Lipoprotein (HDL, often called the “good” cholesterol) counts in one’s bloodstream. Finally, Boer Goats in particular tend to have a gentle nature (though they are still goats, and when they get a hankering for chicken feed, for instance, they can be pretty hardheaded). That gentle nature is what we hope to foster on our farm.